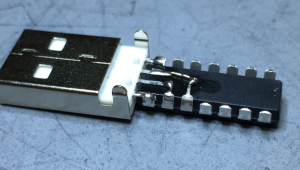 Believe it or not, this is the USB temperature data-logger project recently (June 15, 2015) posted on Hackaday.io by Michael Mogenson. Now the temperature sensing aspect of the project is relatively interesting to me, what is absolutely unique is the ingenuity applied to the mechanical construction of the device (see figure above!). This design is so radical that it might just work. In fact I find it could be easily the most vivid representation of the unique capabilities of the PIC16F145x series, featuring a Crystal-less Full Speed USB device interface! Not only there is no crystal, but there are not caps as well. In fact all pins of the device have been filed away! Even the choice of the PDIP package is adding a somewhat nostalgic note to the whole (most designers today would choose one of the minuscule UQFN packages) and nicely highlights the ideal placement of the power supply and D+/D- pins on the device. Vote it for the 2015 Hackaday Prize! This entry was posted in PIC16, Tips and Tricks and tagged PIC16, USB. Bookmark the permalink.